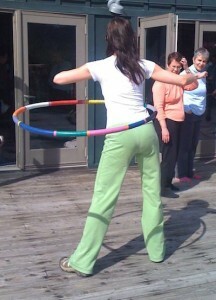 Home / Tails from the Trail / Hula Hooping Can Improve Your Riding! Hula Hooping Can Improve Your Riding! This winter keeps hanging on. Many of my students haven’t been able to ride because of the cold, poor footing or inability toget the trailer out of the driveway. I am included in this dilemma as I have been unable to ride Al for two months due to travel and bad weather. But this doesn’t have to stop you from improving your riding! Hula hooping is a great way to stay fit, improve your symmetry, coordination and turning aids without ever leaving the comfort of your living room. 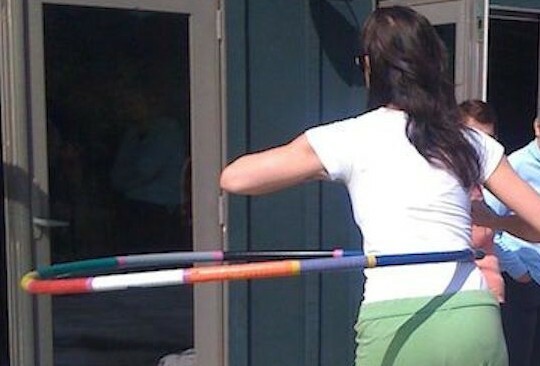 The key to hula hooping as an adult is to have the right hoop. Many people remember doing this as a child and think they should still be able to use those small, light-weight hoops they used back then. But as an adult you need a larger heavier hoop, approximately 40 – 42″ in diameter and 1.75 lbs. This is a great size and weight to get you back in the swing! Once you become proficient at hooping then you can progress to smaller, lighter hoops, which are considered more advanced. Hoops can be purchased in a variety of places. My local health food store has them for sale, you can find directions on how to make your own on the internet using PVC tubing or you can purchase a hoop on line at one of several sites including: hoopnotica.com or canyonhoops.com. Be sure to check the sizing chart and find a color scheme you like. There are also instructional videos on how to get started and advanced hooping exercises. And if you really get into it you can wear some of the hippy, skimpy clothes! If you live in California (where I first learned about these larger hoops) you can go to any number of parks where people hoop together for fitness, friendship and fun. To give you an idea as to how hula hooping can improve your riding I have put together this short video. Rosemary Ganser DVM, the student in the video, has been working intensively with me for almost 3 months. She comes down from Connecticut for two or three days at a time for intensive sessions. We work from 3 – 5 hours/day. The sessions are a combination of Feldenkrais® Functional Integration® (table) lessons, working on an exercise ball, hula hooping and riding depending on the weather. 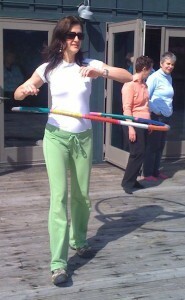 Rosemary had not hula hooped prior to our session in January when I taught her how and sent her home with a hoop. This video was filmed the morning of the 2nd day. That morning she arrived being able to hoop in both directions and with the hoop on her hips for the first time. Rosemary had problems with riding to the right and cantering left. You can see in the video that she has difficulty hooping to the right and her body position was much less organized to the right. However, she has since greatly improved and can how hoop both directions. The intensive sessions have significantly improved her riding and overall ease of movement throughout her day.